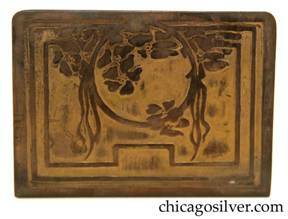 Chicago and Boston were the centers of Arts & Crafts metalwork in the first part of the 20th Century. But metalcraft thrived in other parts of the Midwest as well. Cleveland was the home of The Rokesley Shop, Potter Studio, and Carson and Barnum. 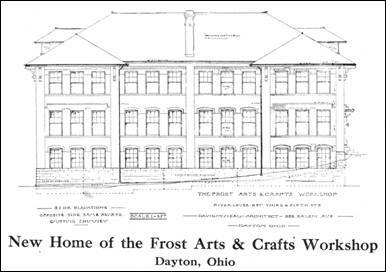 Forest Mann, who created the Forest Craft Guild, began his post-graduate work in Dayton and started a company called the Miami Pottery there. "WHEN we organized our workshop, about two years ago, we did not consider the matter of furnishing supplies to individual workers outside of our own workshop, but as soon as we commenced to advertise the workshop's product in various publications we immediately received a large number of requests from individuals living in remote localities, in which they requested us to make them prices on various materials required in order to produce articles at home. In the beginning we attempted to answer these letters by referring the individual to dealers who furnished specific articles. This, however, soon became such a burden that we concluded to issue a small price-list covering the more frequently called for articles. The price-list was a very small affair, consisting of but four pages and without illustrations and with very meager descriptive matter. In spite of the above facts, we received a large number of orders for almost every article listed on the price-list, and in order to meet the increased demands of home workers, we have concluded to publish a catalog which we trust will be of benefit to individual workers in all of the various crafts. In this catalog we have placed illustrations so that purchasers will be better able to form an idea as to just what we offer for sale. There are many articles not listed in this catalog which we can easily procure for you, and which we will be glad to furnish on request, but as these special articles will not be carried in stock, it will naturally require a few days for us to secure them. "We will be very grateful for suggestions relative to future editions of this catalog, for it is our aim and purpose to create a supply department for the home workers from which can be procured almost any material or tool that may be required in any particular class of work. It is the desire of the workshop to assist our fellow-craftsmen in every way possible. We do not pretend that we are conducting the workshop without expecting a reasonable return for our own honest efforts. On the other hand, we find it a real pleasure in doing all we can to further the Arts and Crafts movement in America." This catalog also mentions that "[d]uring the past two years the business of the workshop has continually increased until the point has finally been reached where our present quarters are inadequate to properly carry on the many lines of work which now receive consideration. The above illustration made from the architect's drawing shows a side elevation of the splendid new workshop which is now in course of erection and which we expect to occupy by August 1, 1909. We have acquired a considerable plot of ground, almost in the heart of the city of Dayton and located along the Miami River, between two of the principal business streets of the city. The river at this point is very wide, and only a short distance from the workshop is located one of the four splendid concrete arch bridges which span the Miami River, so that from our workshop windows we will have a splendid view. Beautiful boulevards run along the side of the river, and the building illustrated above faces along the river front. It measures 40 x 80 feet and is three stories high. The walls are built of pressed brick and the roof is covered with dark red tile. The interior of the workshop is plastered throughout with the exception of the basement side walls. Wood work is in mission finish. On the second floor is located a large display room, in which we will have on display not only our own handiwork, but will also have examples of the best work from other shops, and including fine pottery, etc." 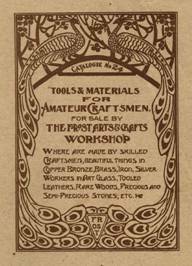 Frost's work is often confused with that from Carence Crafters, The Marshall Field Craft Shop, and the Forest Craft Guild. Frost pieces often exhibit more pronounced hammering than those others, especially on edges. 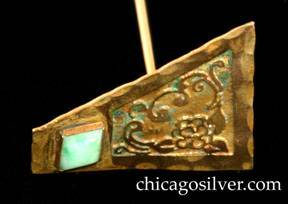 And its craftsmen made extensive use of green verdigris highlights. 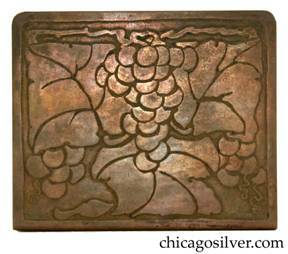 Bookends, brass, large, with deeply etched design of stylized grapes, leaves, and vines. Rounded corners. Nice patina. 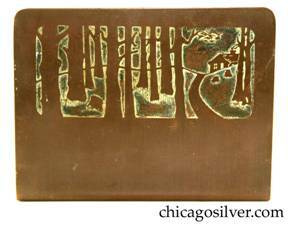 Bookends, brass, large, with etched design of trees and a road curving up to a cabin on a hill. 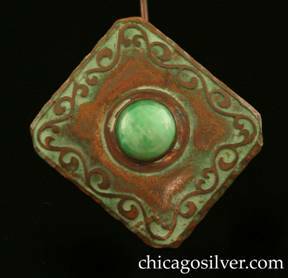 Nice patina and verdigris. Bookends, brass, with rounded corners and acid-etched design of circle with bunches of flowers at the top on each side that have stems or vines trailing down, inside two square concentric geometric frames, one with a jog in the middle along the bottom. 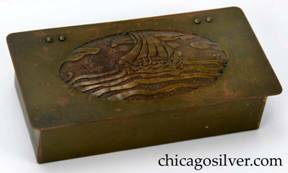 Box, brass, with overhanging hinged lid and hand-worked, acid-etched domed oval decoration on lid of Viking ship at sea under cloudy sky. Ooze leather lining. Riveted hinges. Frost catalog calls this a cigarette box. 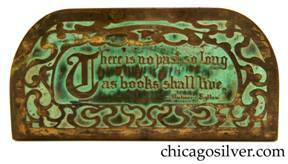 Bookends, brass, with rounded corners and acid-etched design of vines surrounding motto: "There is no past so long / as books shall live. 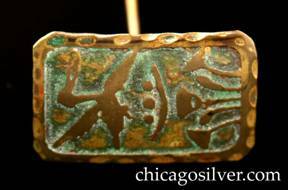 / -- Bulwer-Lytton" Nice patina and verdigris. Older Frost mark. Brooch / Pin, brass, oval with elaborate acid-etched design of heraldic crest with animals and crown on domed oval center. Verdigris-filled background. Brooch / Pin, brass, shield-shaped with six straight sides, with a wide top and narrow bottom, gilded hammered edge, and a gold maze of narrow lines against a blue-green verdigris background with applied splotches of gilding, and a large round bezel-set red and green glass cabochon stone in the lower right-hand corner. Brooch / Pin, oval with flat bottom, hammered copper with cutouts centering large green swirled multicolor bezel-set circular art glass stone. 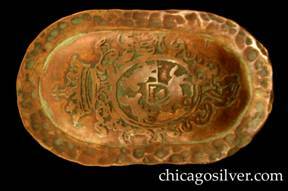 Hatpin, brass, rectangular, with acid-etched design of duck flying over foliage. 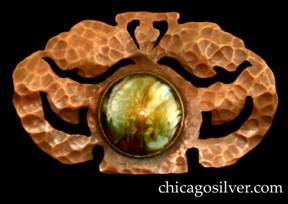 Hatpin, brass, square, with acid-etched design of butterfly, with oval cabochon bezel-set yellow amber stone at top. Hatpin, brass, trapezoidal, with acid-etched design of flower and curving vines at top, and bezel-set greenish-white trapezoidal stone below. 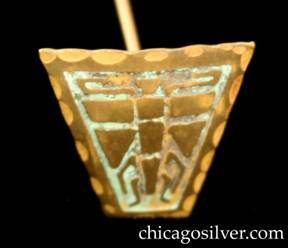 Hatpin, brass, trapezoidal, with acid-etched design of segmented winged insect. 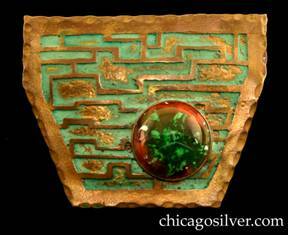 Hatpin, copper, rectangular, with freeform curving acid-etched design around edge centering large round bezel-set green stone. Letter knife, brass, triangular, with flat square end and beveled tapered tip, large convex repousse area in center, acid-etched design of spider-web centering diamond-shaped bezel-set cabochon light green stone. Pin, bar, copper or brass, with chased series of parallel lines centering a diamond shaped area around a bezel-set round green stone. 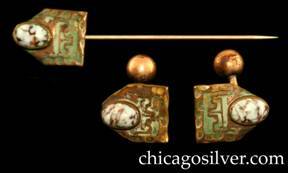 Set, stickpin and pair of cufflinks, brass, each piece made of a five-sided plaque coming to a point at the top, with verdigris-filled acid-etched geometric design, and bezel-set oval gold and blue matrix stone at the top. Cufflinks have curving stem and ball in back. 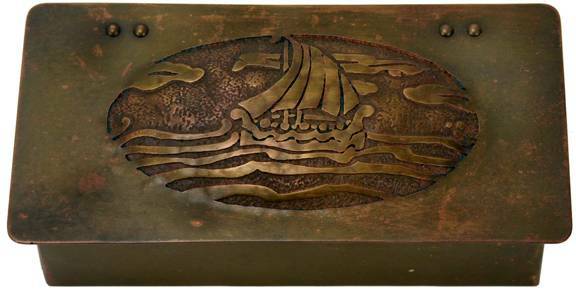 Stickpin, brass, rectangular with lower right corner clipped off and abstract acid-etched design of ship on sea with clouds in sky. Green verdigris background. Stickpin, brass, with round bezel-set cabachon amethyst at the bottom of a trapezoidal, acid-etched background. 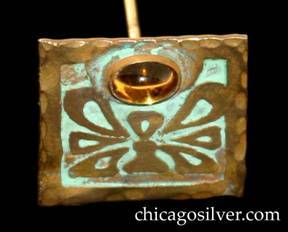 Stickpin, brass, with round bezel-set cabachon coral stone at the bottom of a trapezoidal, acid-etched background. Watch fob with leather strap, cutouts, buckle, chain, and chain attachment, with bezel-set red oval cabochon stone.